Think you can’t drink hot chocolate in the summertime? Think again! 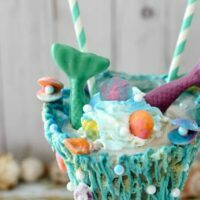 This over-the-top mermaid milkshake is the perfect way to cool off on a hot summer day! My daughter Keira and I seriously love hot chocolate! In fact, when I gave up caffeine during my pregnancies, I had hot chocolate every morning as a substitute. Add a little whipped topping and it’s even more delish! Swiss Miss® Milk Chocolate Hot Cocoa Mix has always been our favorite. I’m just not sure if it’s because it tastes so good or because they add those yummy little marshmallows that we love so much. It could also be because it’s made with real milk. Swiss Miss has been making their signature blend in a Wisconsin dairy for over 50 years. They also support over 80 local dairy farms and package all their products in the USA. Could be, but I still think it’s because of the marshmallows! The problem is that since we live in Florida, it’s way too hot to drink hot chocolate in the middle of summer….or so I thought. 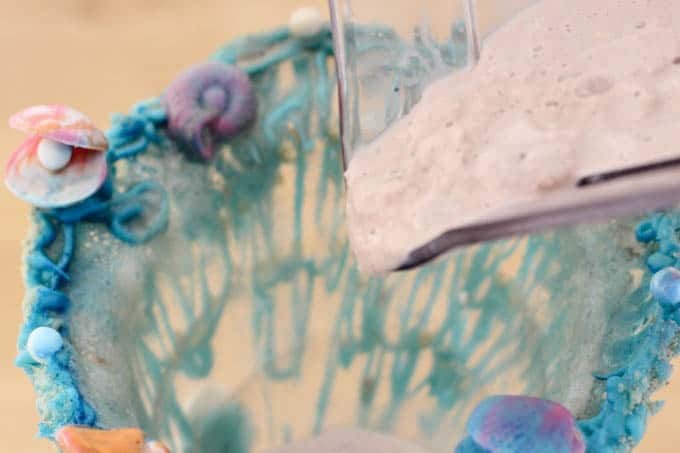 Now that we’ve discovered frozen hot chocolate, this Mermaid Milkshake recipe is our new favorite summer treat. You don’t need much to make these awesome hot chocolate milkshakes. 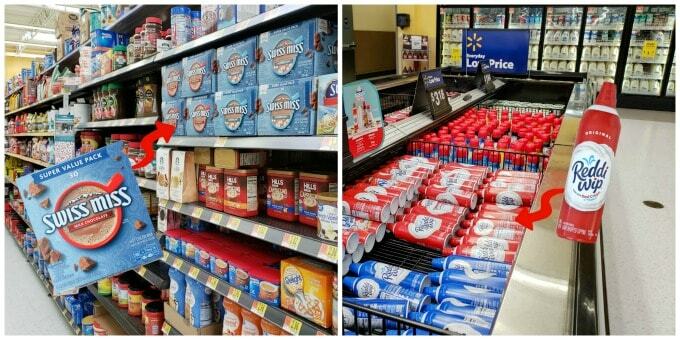 We found everything we wanted at Walmart, including Swiss Miss Milk Chocolate Hot Cocoa Mix and Reddi-wip® Original Whipped Topping. 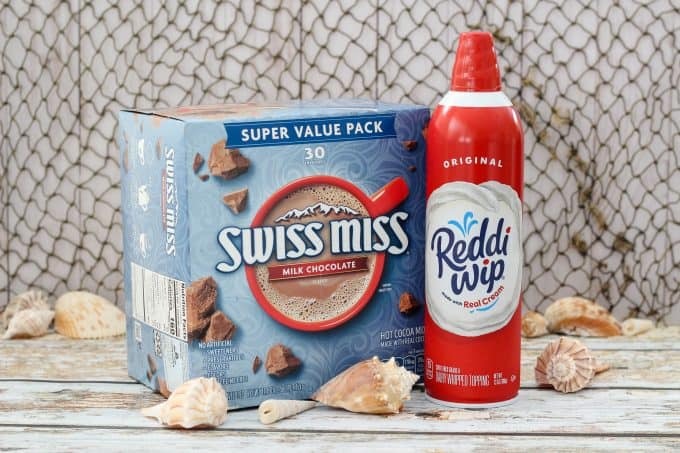 Make sure you get the Swiss Miss without the marshmallows for this frozen hot chocolate recipe. 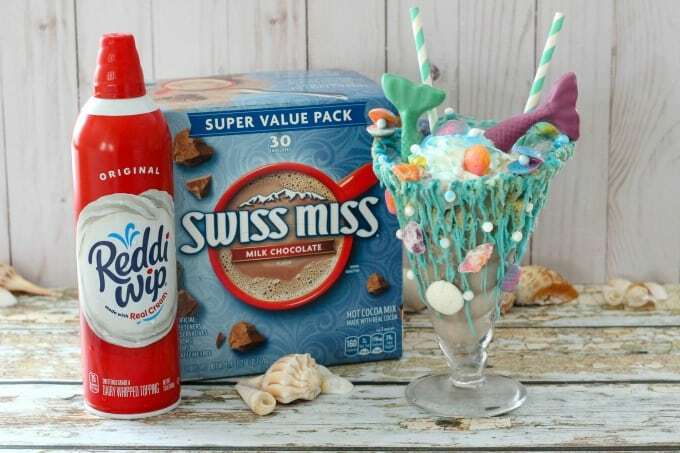 That’s it…we were ready to make some mermaid milkshakes! I’m totally obsessed with candy melts so that’s what I started with! 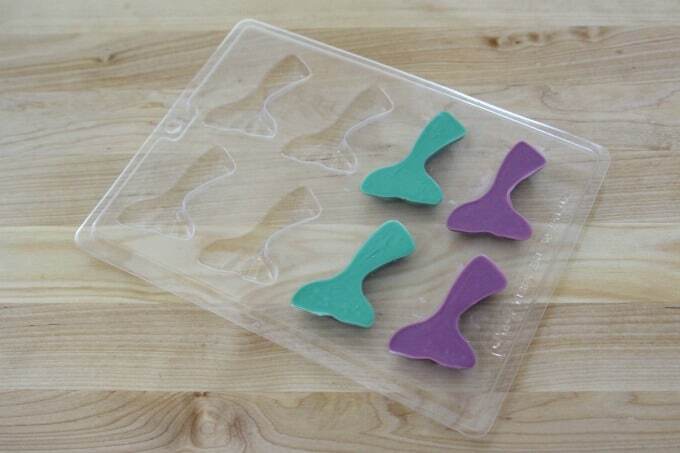 I used these cute candy molds for seashells and mermaid tails. I love combining and swirling different candy melts together for the seashells. The shells are pretty small so you don’t need a lot of melts for them. 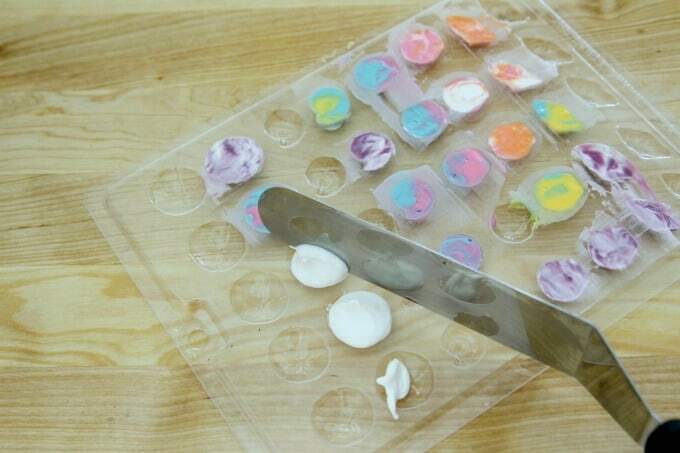 About two melts fills one shell so if you’re filling the entire mold, you’ll need about 40 melts. I wanted lots of different colors so I started with a few pink, orange and white. I used two of each color. After melting them in the microwave for about 60 seconds, I used a toothpick to swirl them together. I filled a few shells, then made several more color combinations so we’d have a variety. 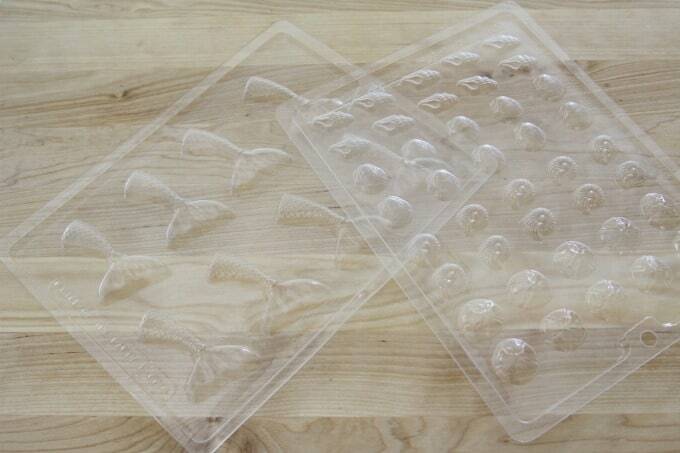 When you’re finished filling the mold, tap it on the counter a few times so that the candy settles at the bottom. 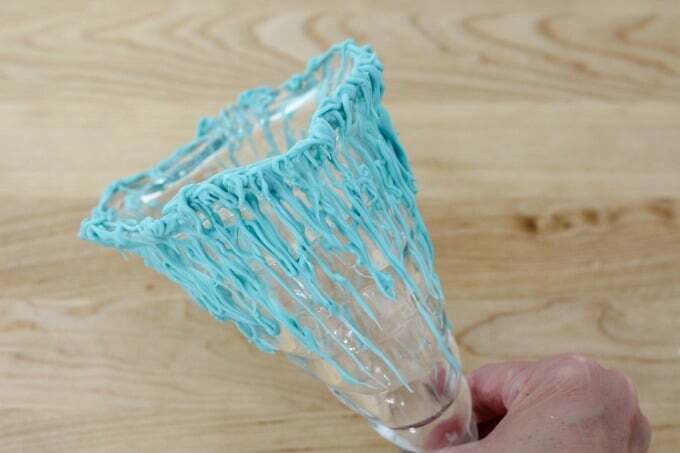 That also gets rid of any air bubbles. When you’re done, scrape off the excess candy. 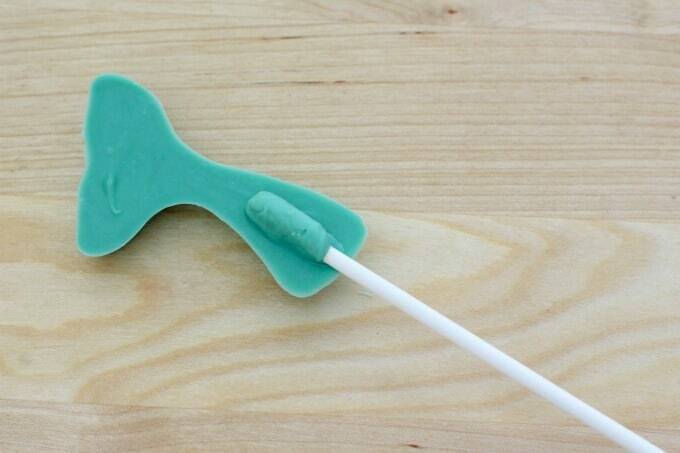 I’ve found that this icing spatula works great but you can use any flat edge. Put the seashells in the refrigerator to harden for about 30 minutes and get started on the mermaid tails. 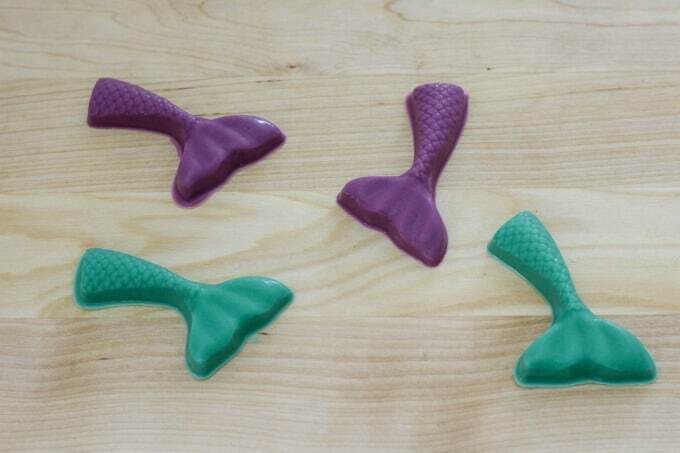 I chose green and purple for the tails and melted about six candy melts per tail. You may have a little melted candy left over but it’s always better to have too much than not enough. Once they’ve hardened, remove the tails from the mold. If they stick, just tap it against the counter a couple times and they should pop right out. Next, you’ll need to attach lollipop sticks to the back. 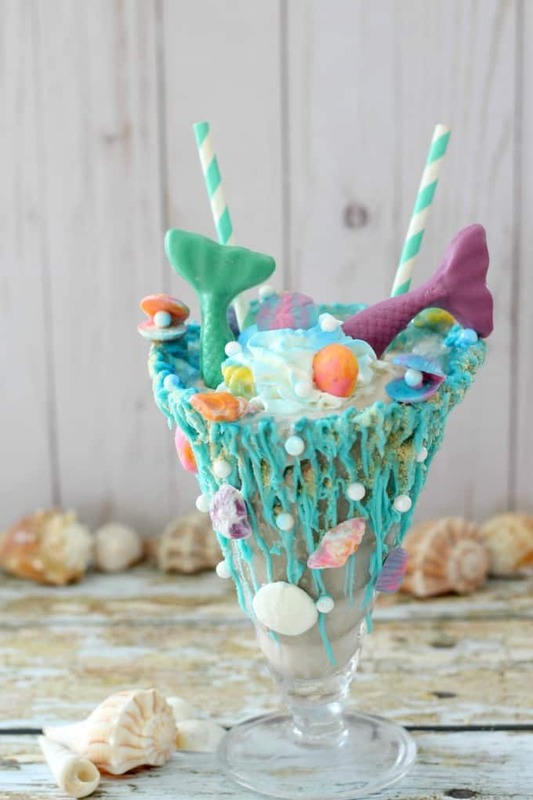 Otherwise your candy mermaid tails may fall over or even sink down into the shake.Using more melted candy melts, attach the sticks to the backs of the tails. Refrigerate to be sure they harden completely. 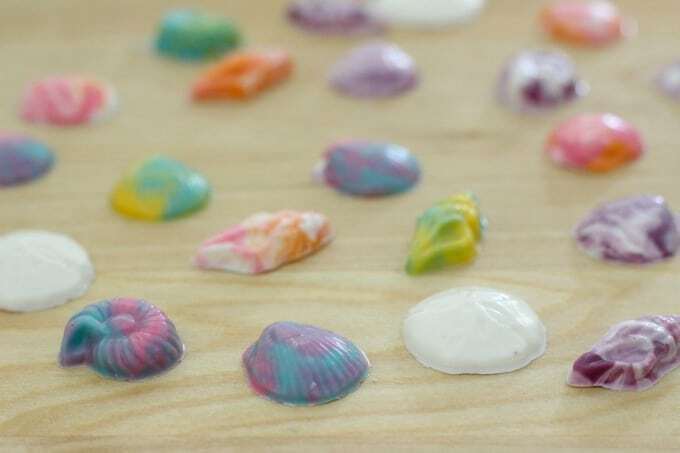 Now pop the candy seashells out of their mold. If you want to smooth out the edges of your shells a little more, just rub your finger against them. 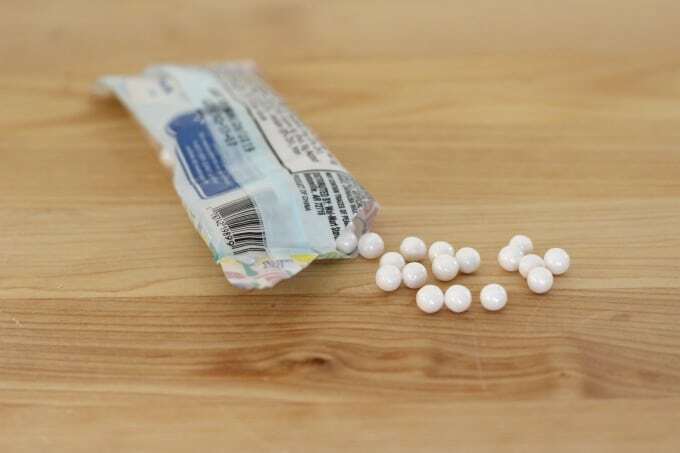 I found these sugar pearls in Walmart’s baking section and thought they’d be perfect for making mini oysters! Start with two shells that had the same color scheme. 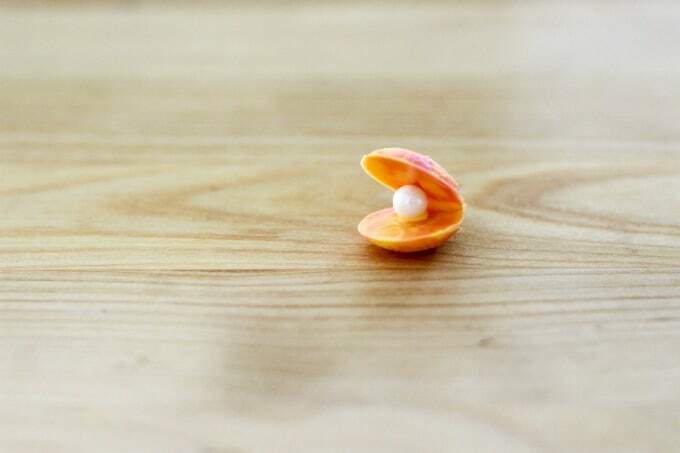 I used just a drop of melted candy to attach the “pearl” to the shell. 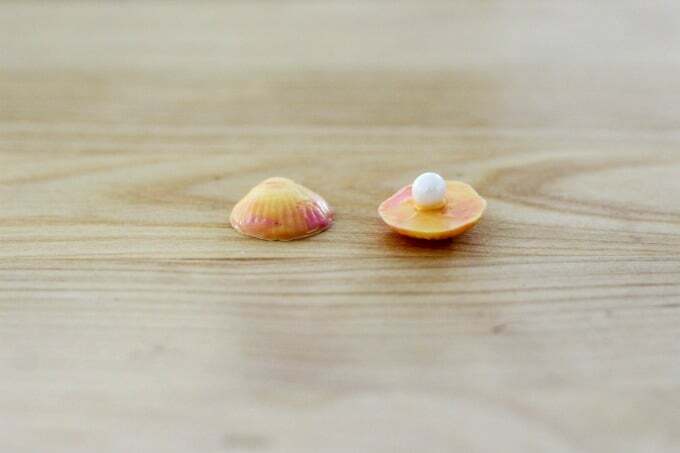 Dip the back part of the second shell (the top shell) into melted candy and attach behind the pearl. 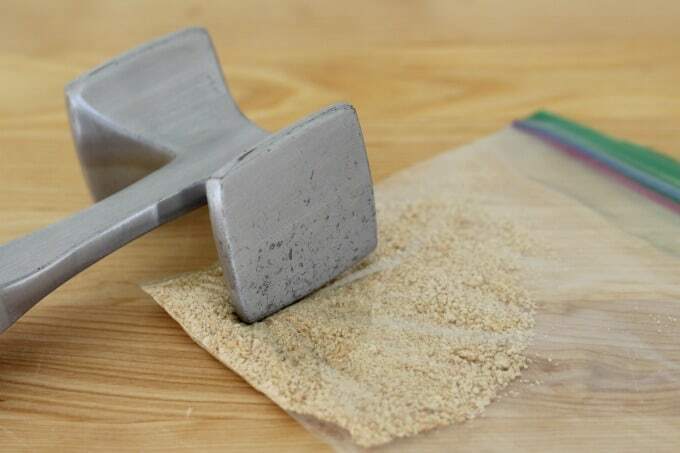 Crush 1/2 graham cracker into a fine “sand”. Set aside. 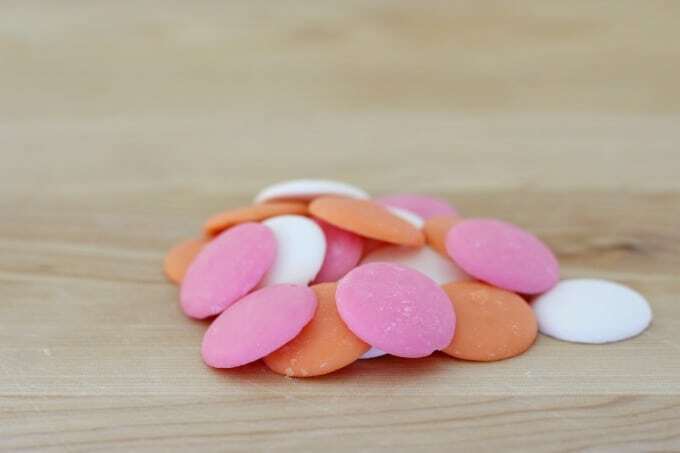 Pour 1/2 cup of blue candy melts in a bowl and microwave until melted. You can add 3/4 tsp vegetable oil if you want a smoother consistency. I do it for larger quantities like this but didn’t bother for the shells and tails. 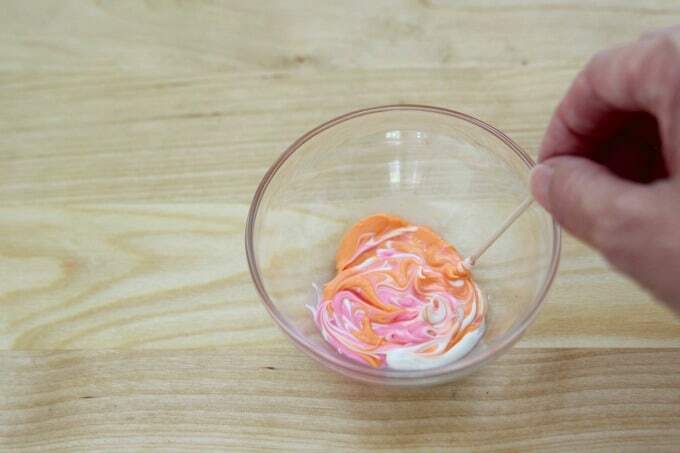 Once melted, you can drizzle with a spoon or use a plastic squeeze bottle. I love the bottles because they make it easier and they usually only cost a dollar or two (you can find these in Walmart’s cake decorating department). Drizzle blue candy melts all around the glass. The more you drizzle, the better it looks! 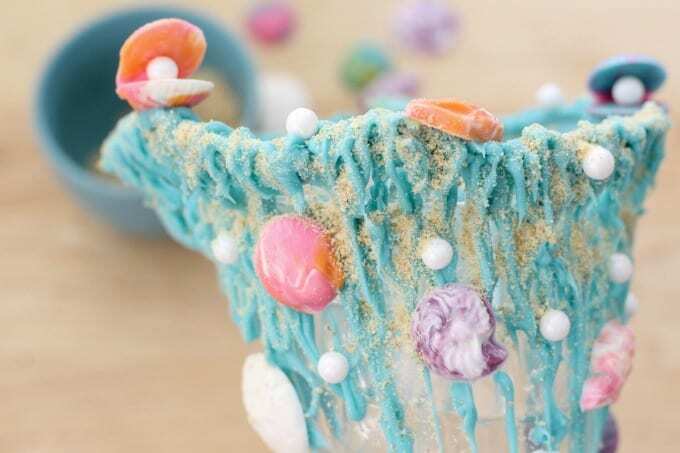 Sprinkle graham cracker “sand” around the glass then use more candy melts to attach seashells and pearls. 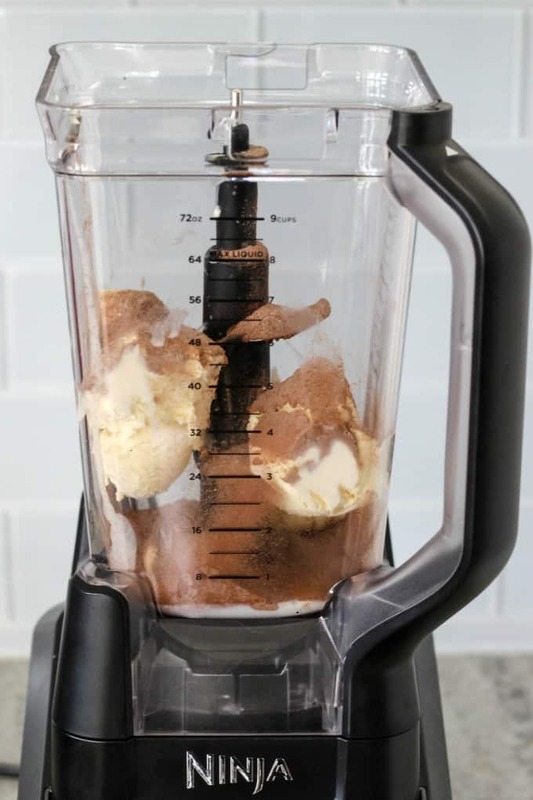 In a blender, combine milk, a packet of Swiss Miss Milk Chocolate Hot Cocoa Mix and ice cream. I like to put in half the ice cream, the cocoa mix, then the rest of the ice cream on top. I feel like it blends together better…but that could just be me. 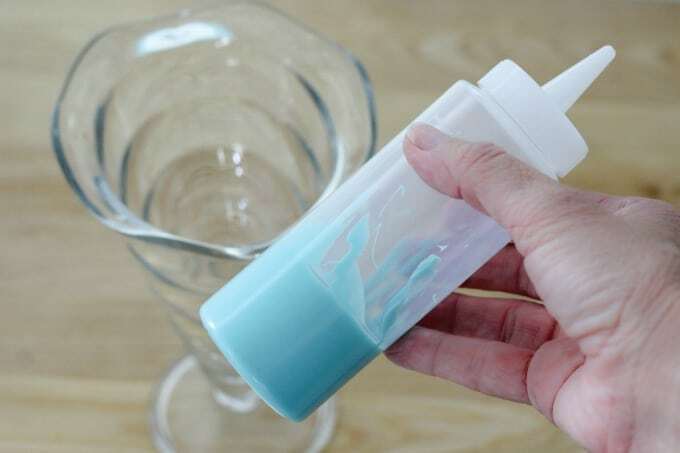 Blend until smooth, then pour into your glass. Top with a dollop of Reddi-wip. 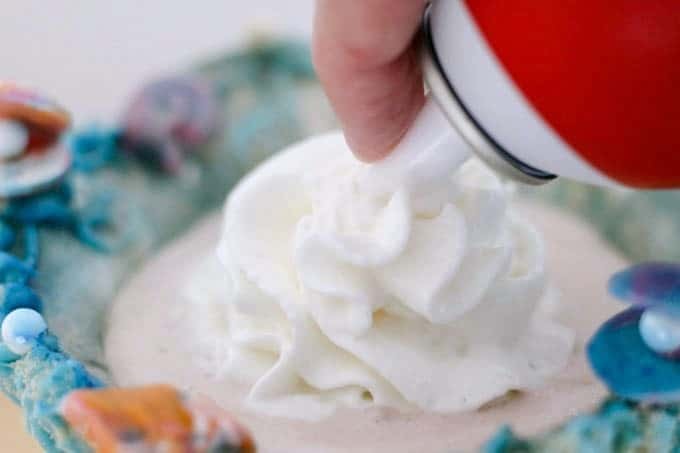 Spray the Reddi-wip it with the blue food coloring spray. 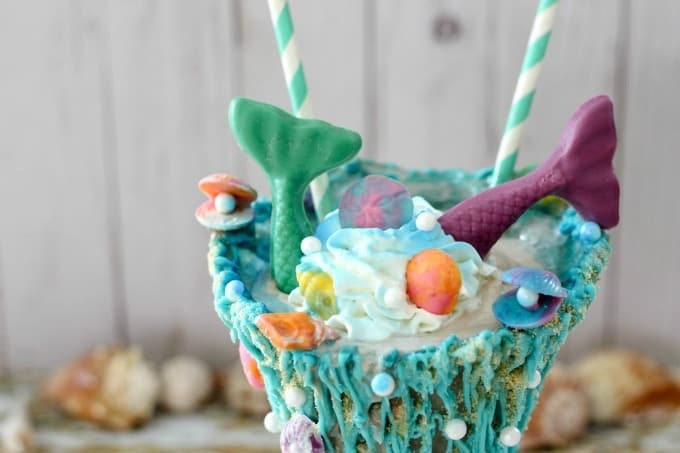 Add mermaid tails, more shells and don’t forget two straws…this is a treat you’ll want to share! This is almost too pretty to drink! This shake was SO good and it really does taste like hot chocolate…without the hot part! If you ever thought you couldn’t have Swiss Miss in the summer, maybe you just weren’t drinking it the right way! Think you can't drink hot chocolate in the summer? Maybe you're just not drinking it right. This frozen hot chocolate recipe may just be your new favorite summer treat! Blend for approximately 30-45 seconds. 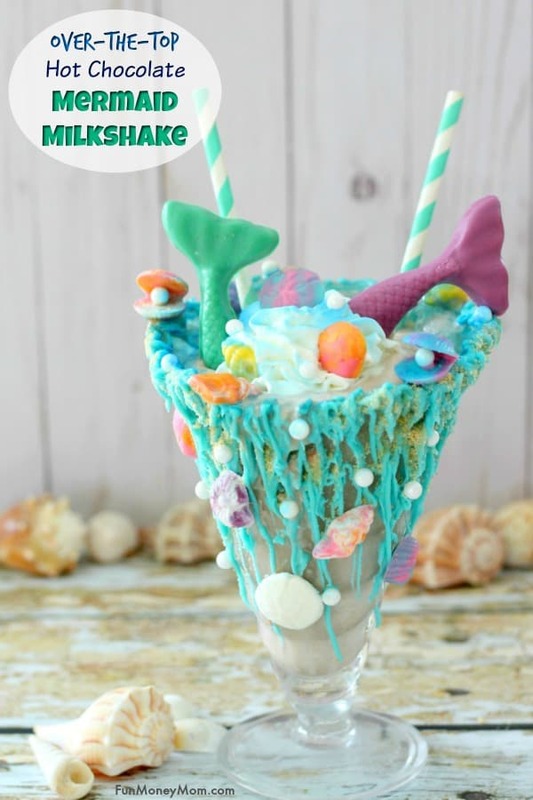 We may have gone with a mermaid milkshake but the possibilities are endless! What kind of frozen hot chocolate theme would you choose? Want more Swiss Miss inspiration? Just head to their frozen hot chocolate page for more delicious recipes!